Photograph of a woman identified on the reverse as Mattie Fitz. 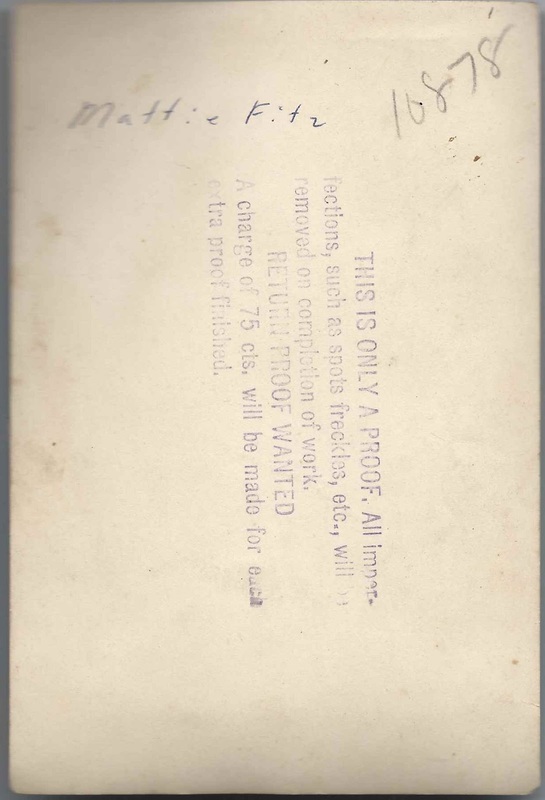 There's a stamp on the front to the left of Mattie's head that mentions the Perry Studio of Bangor, Maine. This might be Martha B. (Cushman) Fitz of Corinth, Maine, and later, Kenduskeag, Maine, wife of Loring or Loren Fitz . Bangor is less than twenty miles from Corinth; Kenduskeag is even closer. 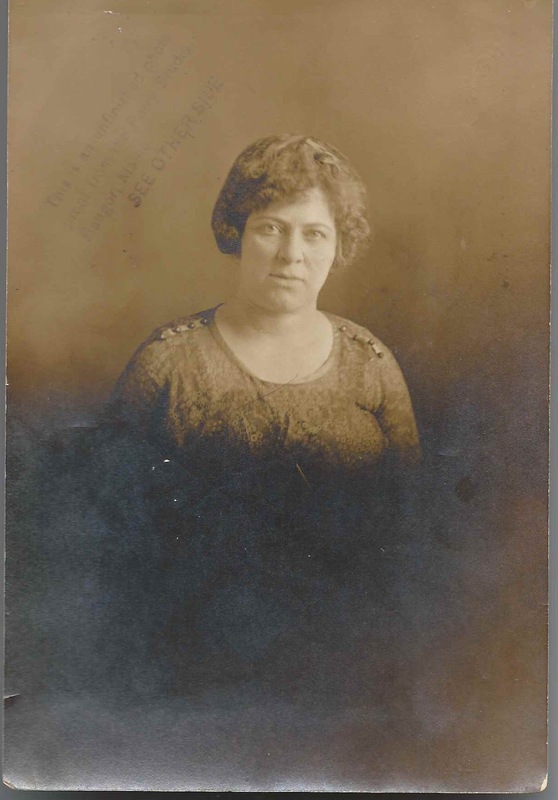 Martha, or "Mattie", was born 8 April 1884 at Corinth, Maine, the daughter of Alex and Ella (Russell) Cushman. I think that Mattie's paternal grandparents were Robert and Sally (Wilkins) Cushman, and that her maternal grandparents were James S. and Martha (Worster) Russell. On 8 December 1899 at Corinth, Maine, Mattie married Loring Fitz, also seen as Loren Fitz. He was also born at Corinth, Maine, and was the son of Andrew Giddings Fitz and Susannah (Stevens) Fitz. I think that Loren's paternal grandparents were Moses and Rebecca Elizabeth (Giddings) Fitz and that his maternal grandparents were Joseph and Eliza Stevens. Mattie and Loring lived first at Corinth, Maine, and later at adjacent Kenduskeag, Maine. They had at least two children, daughters June Vera and Bula Avis. Mattie may have been the Martha B. Fitz who died at Newburg, Maine, on 21 November 1961. Loring Fitz, and perhaps Mattie as well, was present at the 6 August 1899 Mount Desert Ferry Disaster which resulted in the death of twenty people who had planned on a pleasant outing to see the warships of the North Atlantic fleet as they paid a courtesy call at Bar Harbor. As multitudes were rushing to board the Steamer Sappho in order to gain the limited seating, the gangplank broke, and as many as 200 people were thrown into the water. In an article, [page 20 here] and [page 22 here], transcribed and published in the Maine Coastal News, Loring recounted how he saw his cousin, Clifford Cushman drown in the melee. I believe that Clifford Cushman was the son of Isaac and Hannah (Fitz) Cushman. Hannah was the daughter of George Giddings Fitz, older brother to Loring's father Andrew Giddings Fitz. If you have corrections and/or additions to the information above, or if you feel that the woman in the photograph is another Mattie Fitz, please leave a comment or contact me directly.